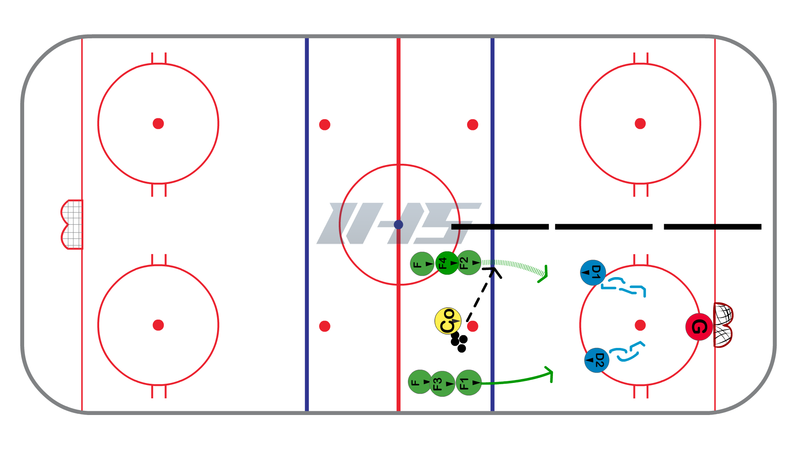 This 2 on 2 drill us typically used for station or ADM based practices and played in a smaller area. The animation and diagram show this being run using a quarter if the ice. It can also be run using half ice and is more suited for older players when you can use half ice. Start the drill with two players on defense facing the two opposing offensive players. The coach starts the drill by giving a pass to one of the offensive players. The two offensive players will attack the defenders and play 2 on 2 below the blue line. If the offensive players score then the coach plays a new puck into the zone and the play continues. The defenders must get possession of the puck and make a tape to tape pass to one of the next offensive players in line. Once they do that they go to the back of the line. The players that were on offense now become the defenders and they play 2 on 2 against the two new offensive players until they can make a tape to tape pass to the next two players. If the defenders do not make a good tape to tape pass to the next players in line then the coach plays a new puck into the zone and they must keep playing. This prevents them from just throwing the puck out of the zone. Fowards try to isolate one defender and create a 2 on 1 instead of attacking the 2 on 2. Defenders should also be aware of player without the puck and communicate to which player they have. Defenders need to control puck even if they have to pass to each other before making pass to next set of forwards.